Aboriginal people erected the Tent Embassy in 1972 in Canberra to protest against a court decision over mining operations on Aboriginal land. Many struggles and battles later, the Embassy has become a heritage-listed landmark for Aboriginal protest. What led to the creation of the Aboriginal Tent Embassy? In the 1970s, inspired by the Black Power movement in the US, Aboriginal people were politically very active. In Sydney, Australia's first Aboriginal legal and medical services were founded. Aboriginal people demanded land rights for the areas that they lived on since millennia. Land rights were considered the key to economic independence, and land the base to generate resources and employment. To many it came as a shock when in April 1971 the Northern Territory Supreme Court decided against Aboriginal people and in favour of a mining company to have access to Aboriginal land. Australian common law, the justice concluded, did not recognise Aboriginal land rights . Aboriginal people travelled to Canberra to ask the Prime Minister of the time, William McMahon, to give them title to their land, royalties from the mining operations, a right to consent to or reject further development on their land, and the land to be returned once mining operations finished. The Prime Minister promised to look at ways to protect Aboriginal interests, but 9 months later, on the eve of Australia Day 1972, announced that, instead of granting Aboriginal people title to their land, his government would ask Aboriginal people to apply for new 50-year general purpose leases over such land. They would also have to prove that they put that land to 'reasonable' economic and social use. Aboriginal people had no title to mineral and forest rights . Angered by this announcement, Aboriginal people gathered in Sydney and decided that on Australia Day 1972 four representatives would travel to Canberra to protest against this decision. They were Michael Anderson from Walgett, Billy Craigie from Moree, Bert Williams from Cowra, and Tony Coorey from Tweed Heads. The four erected a beach umbrella surrounded by placards in front of Parliament House proclaiming it an 'Aboriginal Embassy'. "Remember that any gains we have won, we fought for. We got out on the streets, on the land and marched and protested for those gains. Land Rights had been discussed, argued, protested for generations but the 1971 court decision [Milirrpum people vs Nabalco] gave extra impetus to the Land Rights campaign. "1971 was the first time Aboriginal people took the issue of ownership of land to the courts. The Milirrpum people in the Northern Territory were resisting a bauxite mine opening up on their territory at Gove [Peninsula, NT], the Milirrpum versus Nabalco case. The Supreme Court judge, [Richard] Blackburn, found that we Aboriginal people didn’t have any rights of ownership of our land under common law, particularly in relation to mining claims. "Then on the 25th January 1972, the liberal prime minister at the time, Billy McMahon, issued a press statement saying that land rights for our people would never exist. All that we would ever get from any government was a system of perpetual leases on land we already owned and occupied. "That court decision and the government’s reaction was the impetus behind the Black Caucus [a core group of the Redfern 'Black Power movement'] deciding to send the four men to Canberra to set up the first Aboriginal Tent Embassy on the 26th January 1972. They were messengers for the group here in Sydney." Why is it called an 'embassy'? Because they had no rights in their own land the Aboriginal protesters thought that they were 'aliens in [their] own land' . As aliens they would need an embassy of their own. Of the original founders, Tony Coorie went back to Sydney the next day. Bert Williams had to report in to the police in Melbourne two days after the erection; he died three months later . Other important people connected with the embassy are Gary Foley, a very intellectual and multi-faceted man, Chicka Dixon, a tribal elder responsible for the political leadership, Pearl Gibbs and Paul Coe . 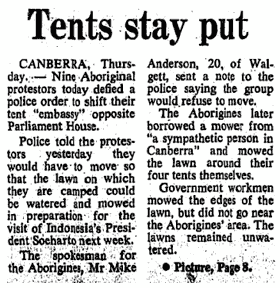 The Tent Embassy was only ever intended to be a momentary act of protest. It shattered claims that the local Aboriginal power movement was violent and racist, as it mounted an effective, peaceful protest . According to the last remaining founder and the first ambassador of the Aboriginal Tent Embassy, Michael Anderson, the term 'tent embassy' was coined by the media and came into use only in 1992, 20 years after it was set up. The government has to water the lawn. In February 1972, in a desperate attempt to move on Aboriginal protesters the government tells them that it needs to "water the lawn" . Over the next days and weeks more and more Aboriginal people made their way to Canberra to join the activists at the Tent Embassy. A loophole in Australian Capital Territory laws allowed camping on the laws of Parliament House as long as there were less than 12 tents, and the protesters took this to their advantage. Over the weekend of the 5-6 February 1972, members of the tent embassy drew up a petition to present to the government. In it they asked for full control of the Northern Territory including all titles to minerals, ownership of all other reserves and settlements in Australia including mineral and mining rights, preservation of all sacred lands in Australia, legal title and mining rights to areas of 'certain cities', and compensation payments for all other land taken from them. Opposition leader Gough Whitlam visited the Aboriginal Tent Embassy on February 8 to discuss the petition. But the government did not sleep. Hastily it drafted a new law banning camping on unleased Commonwealth land within Canberra. On July 20, just hours after the new law came into effect, police moved in violently and forcibly removed tents and arrested Aboriginal people. Within days the Aboriginal embassy population swelled to several hundred protesters who re-erected tents only to clash with police again. The following amateur video is part of the film Ningla A-na. It captures the second raid by police on 23rd July 1972. Note the number of police visible in the first few moments of the video. By 30 July more than 2,000 Aboriginal people and their supporters had gathered at the embassy . 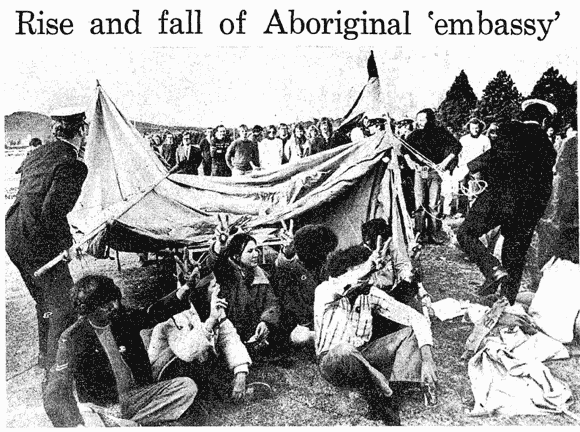 On 13 September 1972, the ACT Supreme Court declared the removal of the Aboriginal Tent Embassy illegal because the law that underpinned it had not been notified 'in the prescribed manner' . The embassy was re-established and remained on the lawns of Parliament House until 13 February 1975, when the Department of Aboriginal Affairs and the Minister for Capital Territory negotiated its removal. On the embassy's 20th birthday, 26 January 1992, it was set up again. By then the Parliament House was no longer used by the government which had moved to Capital Hill. 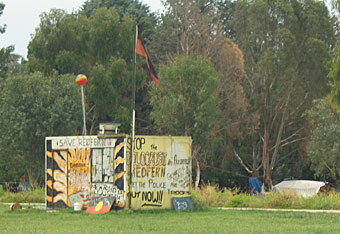 On 26 January 2012 the Aboriginal Tent Embassy celebrated its 40th anniversary, making it Australia's longest standing site of political agitation . "The Embassy has played a huge role in the introduction of Aboriginal land rights and the struggle to end racial discrimination in this country," says Cathy Eatock, member of the Aboriginal Tent Embassy 40th Anniversary Organising Committee . "There really is no equal in terms of an Aboriginal icon. The Embassy is an international symbol for Aboriginal and non-Aboriginal people alike." However, some local traditional owners of the Canberra region have objected to the Embassy's appearance, insisting that it disrespects them . On 9 April 1995 the Australian Heritage Commission registered the Embassy site on the National Estate. Over time, arson attacks have damaged or destroyed some of the structures on the site. The Aboriginal Tent Embassy has become a lasting symbol of Aboriginal unity on land rights and sovereignty. The Embassy has been replicated in a house at Mugga Way, Red Hill, at Victoria Park and Mrs Macquarie's Chair in Sydney, in London, Brisbane and Adelaide . Singer John Farnham (known as 'The Voice') came to the attention of ASIO, Australia's secret service, in 1972 . Farnham was meant to give a concert to raise funds for the Tent Embassy, but the concert was never scheduled. ASIO did not pursue further actions. Few know that the Aboriginal Tent Embassy helped end the policy of assimilation. Gough Whitlam was challenged on his party's policy by another politician. Six months later, when Whitlam was elected Prime Minister, he ended assimilation. "On 25 January 1972, a small group of us Kooris were protesting outside NSW Parliament House in Macquarie Street, Sydney, because the Liberal (Coalition) Party had come out in Canberra the previous night with its policy on land rights," he said. It did not include any admission that Aboriginal people had any rights to land and compensation. "We disagreed with that and held a meeting in Lynne Craigie Thomson's place of abode in Burton Street, Surry Hills, just down the road from where the Deadly Vibe magazine offices are now. "I moved that we take over Pinchgut Island in the centre of the Sydney Harbour because the American Indians had taken over Alcatraz just three weeks earlier. I was out-voted by one vote and the decision was not to recognise Australia and set up our own 'Embassy' in Canberra. "The next morning, Monday 26 January, Canberra awoke to four young Aborigines—Billy Craigie, Tony Coorie, Michael ['Ghillar'] Anderson and Bert Williams—standing under a large beach umbrella [in front of Old Parliament House]. "I was a wharfie at the time and joined them on the Friday. The Member for the ACT, Kep Enderby, informed me that there was no legislation under the Federal Act to remove campers, so we put up eight tents and gave ourselves portfolios. "A dear, kind lady from Canberra gave us a big blue tent which became the official 'Tent Embassy'. "Like all embassies we needed a flag, so Harold Thomas, [designer of the Aboriginal flag] from Adelaide, gave us his flag to fly." The Tent Embassy was busted by police on 20 July 1972 in "the most violent demonstration" Chicka Dixon had ever participated in. Chicka Dixon turned 81 in 2009. Read or listen to an Interview with Michael Anderson. 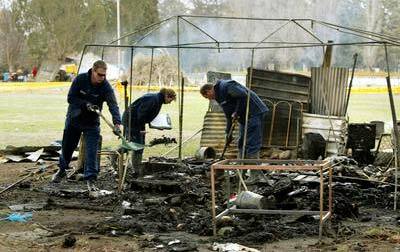 While the tent embassy in Canberra was Australia's first, it is not the only one set up since. Inspired by the 40th anniversary of Canberra's Aboriginal Tent Embassy, the local Yaggara people set up the Brisbane Sovereign Embassy, as it is formally known, on 13 March 2012 at Musgrave Park, and held its official opening ceremony on March 24. The Embassy was set up to recognise the Aboriginal community as tribes, to protect Aboriginal people’s rights to sovereignty possession and occupation of the lands . Map: Some of Australia's Aboriginal tent embassies. You can try to write to the Aboriginal Tent Embassy directly or contact the Old Parliament House.